generally does not provide actionable information for investors. For evidence, we can look at the S&P 500 Index for the better part of the last century. Exhibit 1 shows that from 1926 through the end of 2016, the proportion of annual returns that have been positive after a new monthly high is similar to the proportion of annual returns that have been positive after any index level. In fact, over this time period almost a third of the monthly observations were new closing highs for the index. Looking at this data, it is clear that new index highs have historically not been useful predictors of future returns. From January 1926 to December 2016, 319 months, or approximately 29% of monthly observations, were new closing highs. One way to compute the current value of an investment is to estimate the future cash flows that the investment is expected to deliver and discount them back into today’s dollars. For an investment in a firm’s stock, this type of valuation method allows expectations about a firm’s future profits to be linked to its current stock price through a discount rate. The discount rate equals an investor’s expected return. A simple, but important, insight we glean from this is that the expected return from holding a stock is driven by the price paid for it and what its investors expect to receive. Stock prices are the result of the interaction of many willing buyers and sellers. It is extremely unlikely that in aggregate, those willing buyers apply negative discount rates to the expected profits of the firms they are purchasing. Why? Because there is always a risk that expected profits will not materialize or that the price might decline because of unanticipated future events. If investors apply positive discount rates to the cash flows that they expect to receive from owning a stock, we should expect the price of that stock to represent a level such that its expected return is always positive. Unless the expected cash flows are persistently biased downward or upward, we can expect this to be the case. There is little evidence, though, that the aggregate expectations of investors that set market prices have been persistently biased downward or upward. Many studies document that professional money managers have been unable to deliver consistent outperformance by outguessing market prices. In the end, prices set by market forces are difficult to outguess. The market does a good job setting prices, and we can assume that the expected return investors have applied when setting prices is not biased. Therefore, it is reasonable to assume that the price of a stock, or the price of a basket of stocks like the S&P 500 Index, should be set to a level such that its expected return is positive, regardless of whether or not that price level is at a new high. This helps explain why new index highs have not, on average, been followed by negative returns. At a new high, a new low or something in between, expected returns are positive. Today’s prices depend on expected returns and expectations about future profits. If either expected returns or expectations about future profits change, prices will also change to reflect this new information. Changes in risk aversion, tastes and preferences, expectations about future profits, or the quantity of risk can all drive changes in expected returns. All else equal, an increase in expected returns is reflected through a drop in prices. 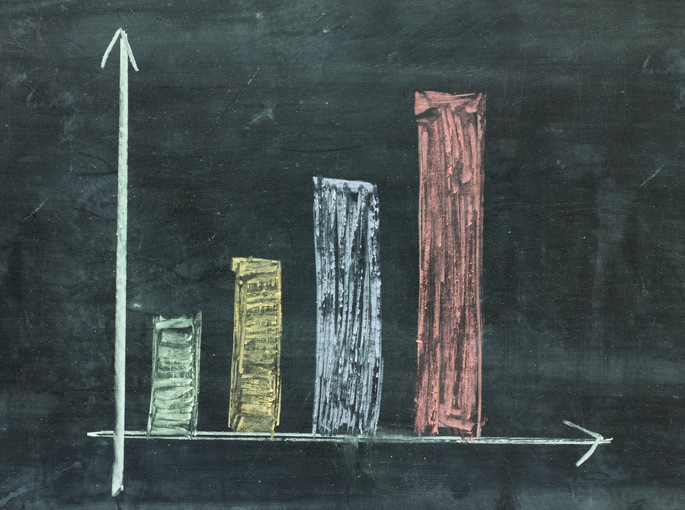 A decrease in expected returns is reflected through a rise in prices. Thus realized returns can differ from expected returns. This means there is a probability that the realized return on any stock, an index like the S&P 500 or the market as a whole can be negative even when expected returns are positive. But what can we say about the relation between the probability of a negative realized return and an investor’s holding horizon? Exhibit 2 shows rolling 10-year performance of the equity market premium (equity returns minus the return of one-month U.S. Treasury bills, considered to be short-term, risk-free investments). In most periods it was positive, but in several periods it underperformed. There is uncertainty around how long periods of underperformance like this may last. Historically, however, the probability of equity returns being positive increases over longer time periods compared with shorter periods. Exhibit 3 shows the percentage of time that the equity market premium was positive over different time periods going back to 1928. 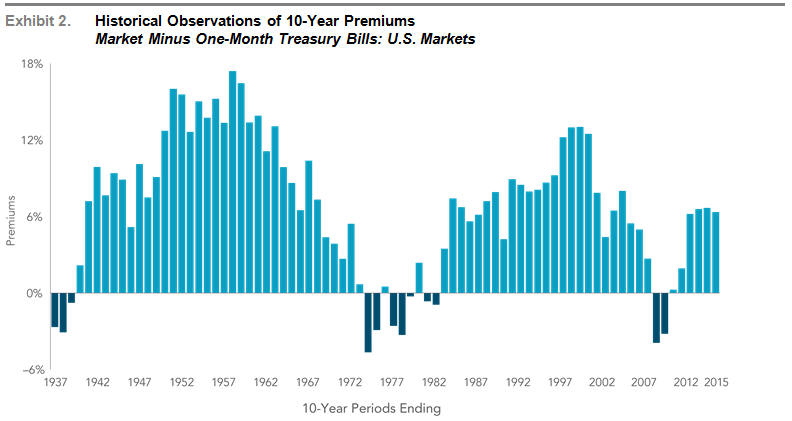 When the length of the time period measured increases, so does the chance of the equity market premium being positive. So to answer our question from before: As an investor’s holding period increases, the probability of a negative realized return decreases. This is why it is important to choose a level of equity exposure that you can stay invested in over the long term. By themselves, new all-time highs in equity markets have historically not been useful predictors of future returns. While positive realized returns are never guaranteed, equity investments have positive expected returns regardless of index levels or prior short-term market returns. The collective wisdom of market participants and their competitive assessment of expected returns and risks allow investors to rely on the information contained in prices to inform their investment decisions and assume positive expected returns from stocks. Historically speaking, over longer time horizons, the odds of realized stock returns being positive have increased. This is one reason why investors should consider investing as a long-term commitment: Staying invested and not making changes based on short-term predictions increases your likelihood of success.